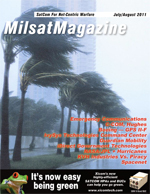 MilsatMagazine (MSM) asked William Beamish of Harris Corporation to afford us additional information as to why the Company made the decision to enter the market for broadband SATCOM terminals. Harris Corporation has made significant investments to develop advanced wideband tactical radios for use by the U.S. Department of Defense and its allies. The radios are geared to run wideband waveforms, such as the Harris-developed Adaptive Networking Wideband Waveform (ANW2) as well as others. However, ANW2 is a line-of-sight waveform. This requires radios to be in relative proximity to one another in order to communicate. Todays warfighters require beyond-line-of-sight (BLOS) capabilities, especially considering the challenges of mountainous and urban terrain found in such regions as Afghanistan and Iraq. The RF-7800B product line was developed to provide warfighters with wideband, on-the-move, BLOS capability in a system to extend wideband networks at the brigade level and below. Inmarsats Broadband Global Area Network (BGAN) is the only available world-wide wideband satellite solution for customers needing mobility, reliability, as well as capacity. What are the key capabilities of the Harris RF-7800B BGAN terminals? How is the Harris offering different from competing terminals and why is this significant? The Harris RF-7800B BGAN line offers high-performance, ruggedized satellite solutions for voice and data connectivity in SATCOM-on-the-move and SATCOM-on-the-quick-halt applications. For dismounted applications, the RF-7800B-DU024 is a Class 2 Land Portable BGAN terminal that provides Internet Protocol data rates up to 492 kb per second; while for vehicles on the move, the RF-7800B-VU104 is a Class 10 Land Mobile BGAN terminal that provides the same maximum data rate. Both terminals meet the MIL-STD-810F standards for ruggedization, meaning they will continue to operate in dusty, humid, cold, or other challenging environments where commercial-quality BGAN units typically fail. These terminals are also configurable and controllable through a laptop computer and enable co-site operation with existing VHF/UHF 50 Watt radio systems. Additionally, the RF-7800B terminals are designed to increase throughput over the BGAN network up to rates over 2 Mbps through Harris-developed TCP/IP acceleration and compression algorithms. This is significant because it dramatically decreases operational costs. Another significant advantage of these terminals is they provide to military customers their integration with Harris wideband tactical radio systems. When combined with the AN/PRC-117G or RF-7800M Falcon III® networking radios, the terminals offer automatic and seamless beyond-line-of-sight range extension of wideband networking data, world-wide connectivity to classified resources, and end-to-end high-grade information security. What is the current landscape in the BGAN terminal market? What are customers seeking? Customers are looking for a way to extend data networks to beyond-line-of-sight, down to the company level. At the same time, there is a need for greater bandwidth. Warfighters today require wideband channels to send increasingly large files, including video, pictures, and other data, that cannot travel over narrowband networks. Deployed personnel also need to tap into the Tactical Internet remotely to access secure resources and other widely dispersed data bases. The RF-7800B provides each of these capabilities in a ruggedized, affordable package, today, while customers await the arrival of next-generation military satellite technology. What does Harris see as the role/future of wideband satellite communications, and how is the company positioned to help bring it to the field? Wideband systems are the most significant advance in tactical communications for the United States military and its allies in quite some time, and this area will only grow in significance. Satellite communications play a critical role in wideband systems with their ability to move data beyond-line-of-sight for operational considerations and over-the-horizon for reach-back to forward-operating bases and headquarters. Wideband communications allow for the use of streaming video  a critical tool for intelligence gathering and on-demand access to the Tactical Internet from the field. As other wideband satellite systems come on line, this will further accelerate the use of applications that are bandwidth-intensive. As the operational costs come down, these systems will become more available for personnel lower in the force structure. Harris is leading this transition, applying the expertise in tactical communications to develop the RF-7800B BGAN terminals as well as the most advanced wideband tactical radios. The Falcon III manpack radios  the AN/PRC-117G and RF-7800M  each allow users to transmit voice and data at on-air rates of up to 5 Mbps. The radios offer a frequency range of 30 MHz to 2 GHz, which is a four-fold increase from current radios, and significantly reduced size and weight. The RF-7800B terminals complement the capabilities of the radios by extending their functionality around the world. What significant milestones have been achieved? When will the RF-7800B BGAN terminals become operational? The RF-7800B BGAN terminals have each received Type Approval from Inmarsat, certifying them for operation over the Inmarsat Satellite Communications System for simultaneous voice and broadband data connectivity. The Harris terminals have been fully tested to meet MIL-STD-810F standards for military ruggedization and MIL-STD-461E standards to eliminate electro-magnetic interference with co-located radio systems. The RF-7800B is operational and in full production  systems have been deployed to several European and Middle Eastern countries, as well as the U.S. Department of Defenses (DoD). What are some of the key challenges facing the DoD in satellite communications, and what can Harris offer to resolve those challenges? Todays military is facing a huge increase of traffic on satellite systems that is creating bottlenecks. Given the increasing hunger for more and more bandwidth, and the already saturated nature of existing SATCOM channels, many of todays warfighters can not get the access they need, when they need it. Next-generation mobile broadband satellite connectivity is still years away. Harris has applied its expertise in communications to provide working solutions today. For instance, the RF-7800B powers a BGAN data mode in the AN/PRC-117G and RF-7800M manpack radios to provide seamless beyond-line-of-sight communications to meet requirements for using existing commercial, off-the-shelf solutions and other commercially available technologies. Harris is offering the RF-7800B as a stand-alone product, as well as part of a wideband tactical communications solution. Can you explain the wideband system and what it provides for users? Why is it unique? Harris Corporation has developed two man-portable radios that currently deliver advanced wideband voice and data networking capabilities to the field through the Harris Adaptive Wideband Networking Waveform. This waveform currently provides warfighters with access to high-data rate applications over line-of-sight linksessentially delivering cable modem Internet access performance to the dismounted soldier without traveling over a phone line, fiber-optic line, or transmission tower. The range of ANW2 can be extended by automatic routing through a beyond-line-of-sight media. The radios have proven their ability to operate other wideband waveforms as well. The RF-7800B line is a crucial piece in extending the wideband networking system to beyond-line-of-sight. One significant advantage of these BLOS links is the ability to extend the range of the radios data transmission capability across the worldliterally connecting a soldier at the edge with senior military. More immediately, however, the BLOS functionality provides over-the-horizon reachback capability, providing real-time links between front-line warfighters and commanders at higher echelons. This enables the network to remain fully connected in any kind of terrain, and allows real-time communications that provide the ability for military organizations to operate with a faster operational tempo and more information than ever before.